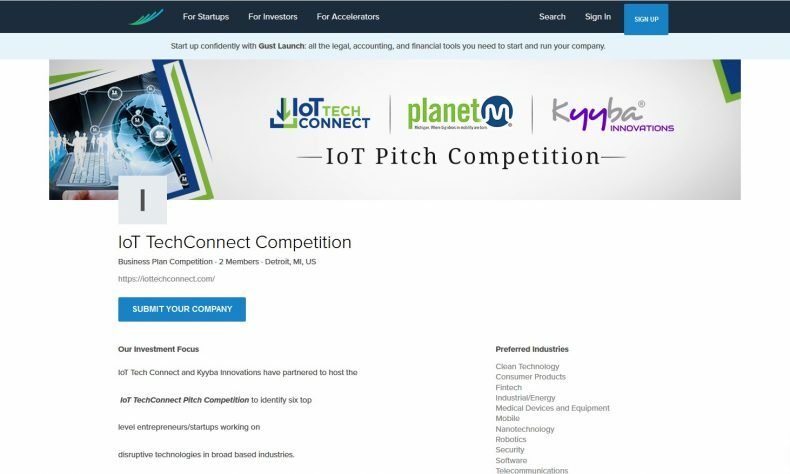 FARMINGTON HILLS – IoT Tech Connect and Kyyba Innovations have partnered to bring the IoT Pitch Competition to IoT Tech Connect, Michigan’s largest conference for IoT (Internet of Things) entrepreneurs. The contest will take place from 4 to 5:30 p.m., Wednesday, April 4, at the Troy Marriott, at the conclusion of IoT Tech Connect. Aimed at identifying the six top-level entrepreneurs and startups working on disruptive IoT technologies, the IoT Pitch Competition will center on autonomous and connected vehicles, augmented and virtual reality, connected tech, smart cities, smart homes, industrial IoT and cybersecurity. During the contest, the six finalists will compete before an audience of automotive executives, venture capitalists, angel investors and Silicon Valley technologists. They will have a total of 10 minutes to pitch the judges and answer questions, in addition to two minutes for transition. The winner, who will be announced at 6 p.m., will be eligible to receive $50,000 in investment and support services from Kyyba Innovations, as well as mentorship from the organization’s extensive network. IoT Tech Connect, “A Survival Guide to the Internet Of Things,” co-produced by MITechNews.Com and CloudTech1.Com, will feature Michigan companies, experts, and products in the rapidly growing IoT segment. Applications for the IoT Pitch Competition are due no later than Sunday, March 4. For more information or to apply visit https://gust.com/organizations/iot-techconnect-competition/public_profile, or contact Jacqueline Perry at (248) 254-4087 or jacquelinep@kyyba.com. Kyyba Innovations is a global second stage startup accelerator investing in technology and IP related startups in a wide variety of industries. The Indus Entrepreneurs (TiE) was founded in 1992 in Silicon Valley by a group of successful entrepreneurs, corporate executives, and senior professionals with roots in the Indus region. There are currently 13,000 members, including over 2,500 charter members in 61 chapters across 18 countries.